Following an outstanding college career that was capped by rushing for 1744 yards and winning the Heisman Trophy, Campbell was the first overall pick by the Oilers in the 1978 NFL draft (Houston traded with Tampa Bay for the top choice). He moved directly into the starting lineup with outstanding results, leading the league in rushing (1450 yards), gaining consensus first-team All-Pro and Pro Bowl honors, as well as Rookie of the Year and MVP recognition (Pro Football Writers, NEA). Campbell followed up in 1979 by again topping the NFL in rushing (1697 yards) and touchdowns (19) to again receive consensus MVP, first-team All-Pro, and Pro Bowl honors. Oilers went 11-5 to finish second in the AFC Central and qualifying for a Wild Card playoff spot while leading the conference in rushing (2635 yards). Lost AFC Wild Card playoff to Oakland Raiders (27-7). 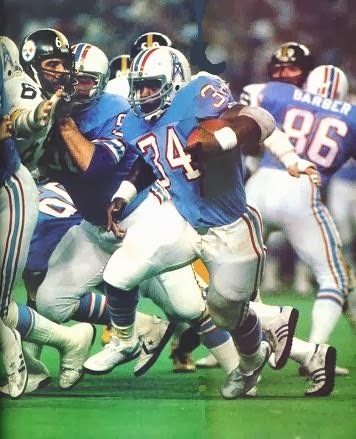 Campbell was named to a fourth straight Pro Bowl in 1981 as he led the AFC with 1376 rushing yards. After one more 1000-yard rushing season in 1983 (1301 yards), his heavy workload and physically-punishing running style caused his performance to drop significantly in ’84 and Campbell was traded to New Orleans during the season. He finished his career in 1985, rushing for 643 yards and a 4.1-yard average for the Saints. Campbell retired with 9407 rushing yards on 2187 carries and 81 touchdowns. His #34 was retired by the Houston Oilers/Tennessee Titans and he was inducted into the Pro Football Hall of Fame, Class of 1991.